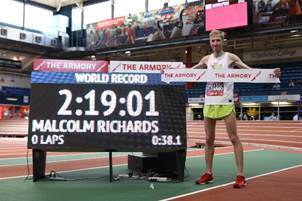 NEW YORK, March 17, 2018 – Both the men’s and women’s indoor marathon world records were broken for the third consecutive year on Saturday during the 3rd Annual Armory NYC Indoor Marathon World Record Challenge Presented by New York Road Runners. 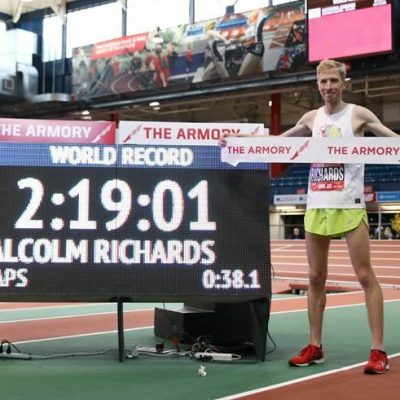 Malcolm Richards, who broke the indoor world record in 2016 when he won the inaugural Armory NYC Indoor Marathon, reclaimed his title with a 2:19:01 time that surpassed 2017 champion Chris Zablocki’s world mark of 2:21:48. Lindsey Scherf, the 31-year-old long-distance sensation from nearby Scarsdale, NY and member of the Westchester Track Club, finished with a world-record time of 2:40:55 to top Finland’s Laura Manninen’s time of 2:42:30 set in last year’s Armory NYC Indoor Marathon. Nick Edinger finished runner-up with a 2:22:06 time followed by Brian Harvey (2:22:18), Eric Blake (2:22:35) and defending champion Chris Zablocki (2:29:13). 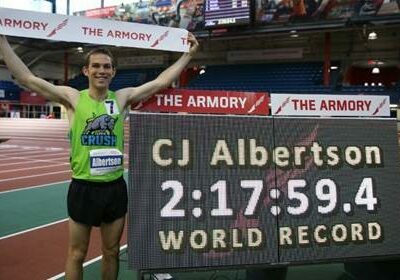 It takes 211 laps around The Armory’s 200-meter banked track to complete 26.2 miles. Richards broke away from his four other competitors nearly 100 laps into the race and never looked back. 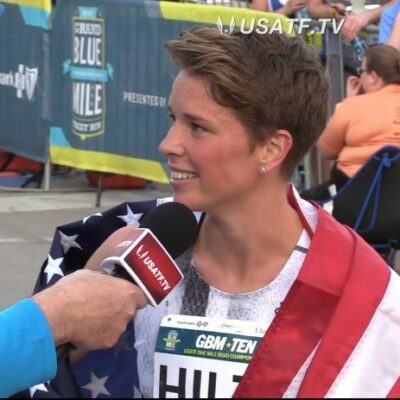 Allie Kieffer, the women’s 2016 Armory NYC Indoor Marathon World Record Challenge champion and former world record holder, fired off the starting gun to begin the race. 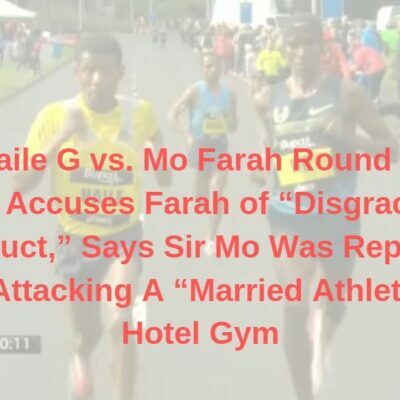 Scherf built an early lead on Ireland’s 50k national record holder and 2012 Olympian Caitriona Jennings and turned her attention quickly to the world record mark. “I pushed the envelope to run against the clock rather than to run within myself,” said Scherf, who shifts her attention to the Two Oceans Marathon’s 56k ultra marathon in Cape Town South Africa in two weeks. “It’s a rare opportunity to be able to hold a record in anything,” Scherf said. “It may not be the hardest record there is but any chance you have to get a record it’s something to behold. I’m really proud of it. I had a lot of people here to support me. Both Richards and Scherf each received $3,000 for winning plus a $4,000 world-record bonus. Edinger and Jennings earned $2,000 each while Harvey won $1,000 for finishing third in the men’s division. 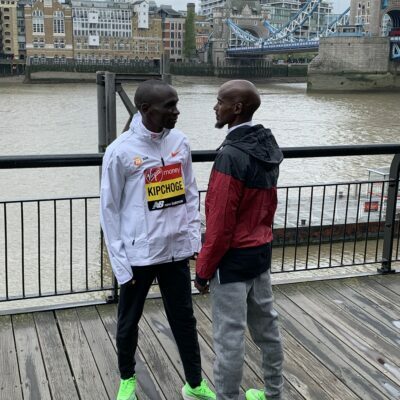 In addition to the individual World Record Challenge, there are six “team” relay marathons during this weekend, concluding with two sessions on Sunday. Entered this year are 100 relay teams consisting up to eight runners per squad from the metropolitan and corporate community are competing in the Armory NYC Indoor Marathon 2018 Team Relay and vie for awards among numerous age groups, corporate, and family divisions. Leading results were as follows. 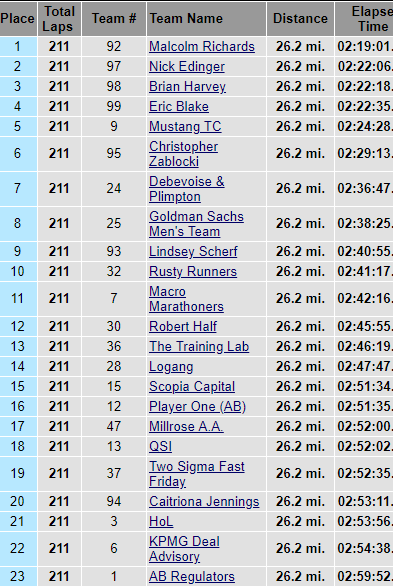 Talk about the race on the letsrun messageboard. 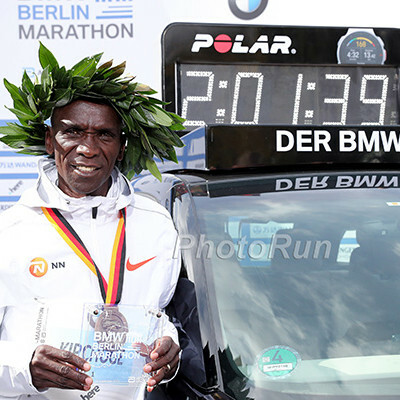 MB: New indoor marathon world records set – 2:19:01 and 2:40:55. Proceeds from the indoor marathon benefit Armory College Prep and the Armory Foundation. 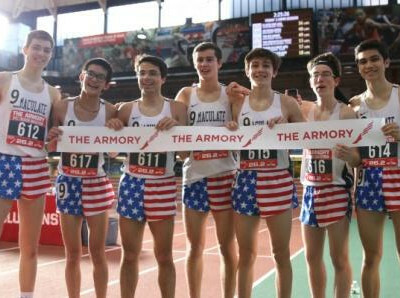 For more information about the NYC Armory Indoor Marathon Presented by New York Road Runners please click HERE.